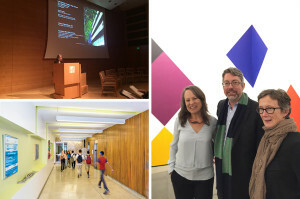 Architecture/Landscape/Interiors Adjunct Professor and Principal of DSH || architecture, Chava Danielson, presented her firm’s work at The Getty Center and UC-Santa Barbara. Chava Danielson participated in the event, Modern Snapshots from the Field, which was hosted by the Conserving Modern Architecture Initiative at the Getty Center. Chava presented DSH // architecture‘s adaptive reuse of Welton Becket’s New York Life Insurance Company headquarters building that transformed it into an urban campus for Larchmont Charter High School. Chava Danielson and Eric Haas lectured on their work with DSH // architecture as part of the Architecture & Design Lecture Series at the University of California Santa Barbara’s AD&A Museum on January 14, 2016.